Introducing fast arthritis relief+, the latest innovation in all-natural, clinical strength anti-inflammatory support for sufferers of arthritis. 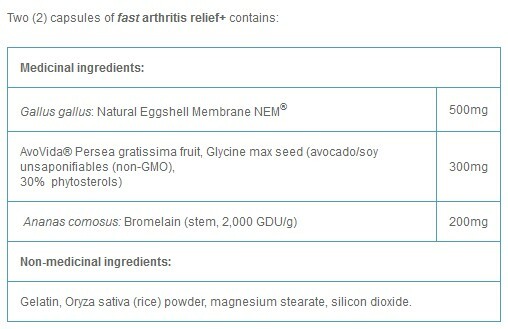 Made with the robust combination of Natural Eggshell Membrane, AvoVida and Bromelain, fast arthritis relief+ is the fastest, most effective way to reduce the pain and inflammation of osteoarthritis, while also rebuilding the cartilage and joint space lost to its damaging effects. There is little to gain from pain. So cease your body pains with these natural solutions for pain relief found on our blog, The Well! AvoVida Research-proven to increase joint space lost from degenerative changes in osteoarthritis. Suggested Dosage: To help relieve pain and stiffness associated with osteoarthritis take two (2) capsules daily, or as recommended by a healthcare practitioner. Consult a health care practitioner for use beyond 2 months. Caution: Consult a health care practitioner prior to use if you are pregnant or breastfeeding, if symptoms persist or worsen, you have a gastrointestinal lesion/ulcer, are taking an anticoagulant/blood thinner, anti-inflammatory or antibiotic, or having surgery. Hypersensitivity/allergy, nausea, vomiting and diarrhoea have been known to occur, in which case discontinue use and consult a health care practitioner. Do not use if you are allergic or sensitive to eggs. Note: fast arthritis relief+ contains no gluten, wheat, dairy, artificial colours, flavours, sweeteners or preservatives. Store in a cool, dry place. Genuine Health Greens+ Extra Energy Natural Orange 797G Genuine Health Inc.